Muhammad Yunus is a Bangladeshi social entrepreneur, banker, economist, and civil society leader who was awarded the Nobel Peace Prize for founding the Grameen Bank and pioneering the concepts of microcredit and microfinance. These loans are given to entrepreneurs too poor to qualify for traditional bank loans. 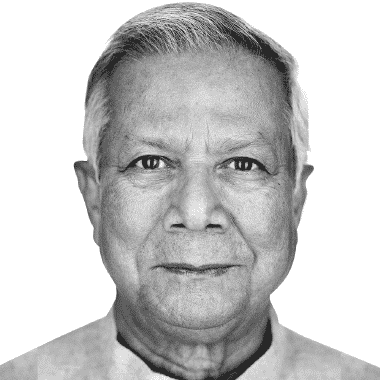 In 2006, Yunus and the Grameen Bank were jointly awarded the Nobel Peace Prize “for their efforts through microcredit to create economic and social development from below”. The Norwegian Nobel Committee said that “lasting peace cannot be achieved unless large population groups find ways in which to break out of poverty” and that “across cultures and civilizations, Yunus and Grameen Bank have shown that even the poorest of the poor can work to bring about their own development”. Yunus has received several other national and international honours. He received the United States Presidential Medal of Freedom in 2009 and the Congressional Gold Medal in 2010. In 2008, he was rated number 2 in Foreign Policy magazine’s list of the ‘Top 100 Global Thinkers’.